Lucifer’s Pizza: LIAR’S PIZZA, more like! UPDATE: since the time of this post, Lucifer’s has CHANGED THEIR WAYS. 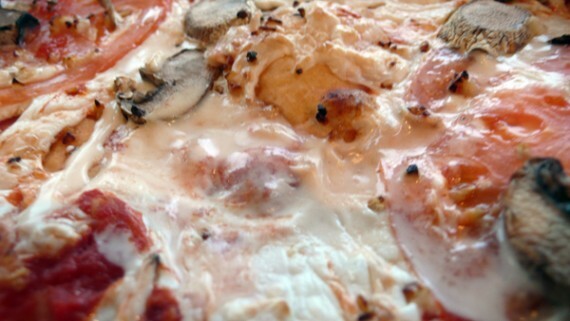 They now offer 100% VEGAN PIZZA made with Teese Cheese! YAY! Sigh. Our mission for quarrygirl.com was never to serially expose vegan establishments that are mistaken and neglectful, but we just can’t let it slip when somebody repeatedly tells us something is vegan, and it turns out not to be. 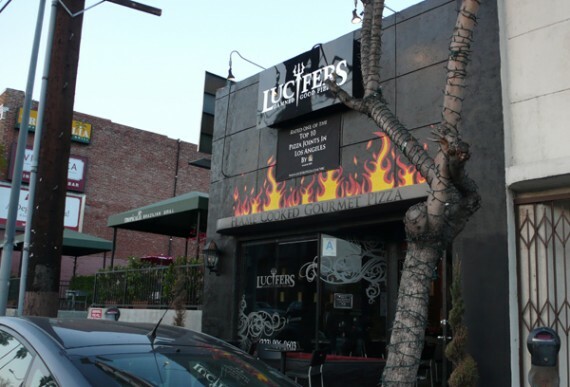 The latest offender is Lucifer’s Pizza in Silver Lake. Sadly, they are a business that covers up the truth, and blatantly lies in the face of honest questions. Here’s the sad story. A few weeks ago, vegans on twitter were buzzing about Lucifer’s Pizza offering vegan cheese as an addition to their regular milk-based offerings. Apparently, they were dropping off flyers to homes and businesses proudly proclaiming “VEGAN CHEESE!” as an offering for only $2 more on a large pizza. As soon as we found out, I called to order a pizza for pick-up, and the person answering the ‘phone confirmed “Oh, yes, we’ve had vegan cheese for a while!”. I asked what brand it was, and for a list of ingredients. After some persuasion the lady (who didn’t know the answers off-hand) got a pack of the cheese and started to list the ingredients, one of the first of which was “casein – a milk protein”. I stopped her right there, and asked if she was sure that was the vegan cheese. She said “Yes, this is what we put on vegan pizzas”. After informing her that cheese was not vegan, she said “oh, I just work here”, and hung up. and I fully understand the importance of having a great Vegan option. Again thanks for the e-mail. I mean, seriously, it appeared to be such a nice and honest response. We had not only an apology but also a resolution – vegan cheese would be arriving “tomorrow”, meaning Monday 27th April. With Adam’s partner being a vegan we had every reason to trust what he said. Although, the response seemed a little too self-effacing and insincere. If I was a vegan, with a partner who ran a pizza parlor with a vegan cheese option I’d probably want to know what brand of vegan cheese he was serving… wouldn’t you? 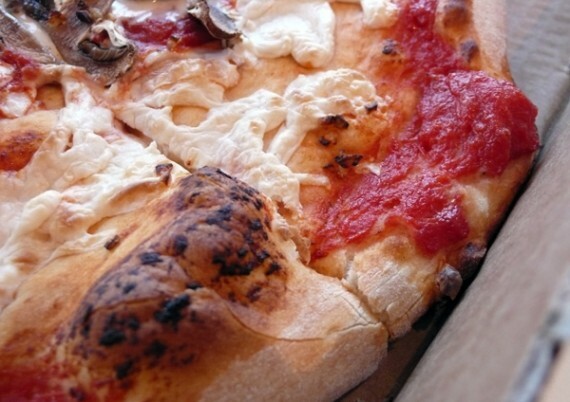 We responded that it was GREAT news they were going to be offering “100% vegan cheese” and suggested they check out Teese as an option, considering how amazing it is on our favorite pizzas in town. quarrygirl: hi, i’d like to find out what kind of vegan cheese you use. lucifers: it’s a soy based cheese from the roma supplier, i don’t know the brand, but it’s 100% vegan. lucifers: —-no, it doesn’t contain casein. we had a cheese that did, but this is a new casein-free cheese from our supplier. it came in today. i just don’t know the brand. but there is no casein. 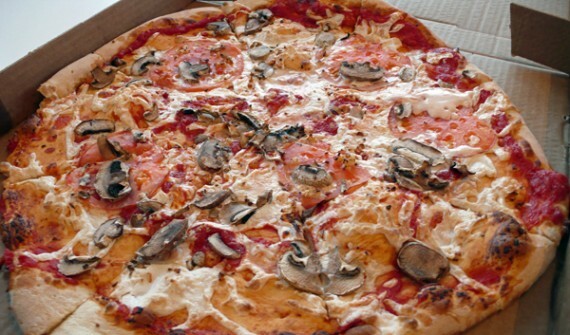 quarrygirl: thanks, we’ll be in tomorrow for a vegan pizza! Again, how much more reassuring could they be? Learning about what we vegans can eat is a rocky road, but we’re happy to work with food suppliers to help them get there. The fact he offered the information about casein really set our minds at ease. So, Wednesday night we had a beer at the Silverlake local Ye Rustic Inn before walking to Lucifer’s hungry as hell and looking forward to vegan pizza. quarrygirl: hey – have a quick question before you make the pizza. Is your cheese completely vegan? quarrygirl: that’s great. Would you mind bringing out the package so we could check it’s vegan? lucifers: sure thing, hold on. quarrygirl: that says “soy cheese” – could you read out the ingredients? lucifers: soy protein, water, casein (a milk protein)…. quarrygirl: hold on a sec, that’s not vegan cheese. Are you sure this is what you put on vegan pizzas? lucifers: —sorry, guys, goodnight then! Sorry indeed. And we’re sorry to break it to so many vegans that have been eating milk at Lucifer’s…. they are LIARS, CHEATS and care not about their customers. I have no doubt that they treat all their customers with such disrespect, be they omnivores or vegans. I could understand how somebody on a cash register, or taking my order over the ‘phone might be confused about what’s vegan, but Adam, who answers the website queries and feigns such vegan understanding should know better. He lied to us twice, his staff lied to us three times more and they have lied to and misled many vegans since they have been serving “vegan” cheese. Note to Adam’s partner: leave a comment with your email address and we’ll hook you up with a real vegan, not one that lies and doesn’t train his staff properly. If, that is, vegan partner you actually exist and are not just another Lucifer’s lie. While Lucifer’s Pizza might be in hell, Purgatory Pizza is closer to heaven in every way (stick to them from now on!). especially as we have unknowingly served a product that is not 100% vegan. come in for a free meal to say thanks for all you help with this. Seems genuine enough, but a really genuine move would have been to remove the pizza from the shelf weeks ago when it was first reported, don’t you think Adam? Plus, we called Lucifer’s twice after receiving this email, and they were still selling casein cheese as vegan.